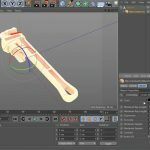 Jonathan Lampel posts a quick tip that shows how you can use triangles for topology in a rigged character to allow for better and more efficient joint deformations. 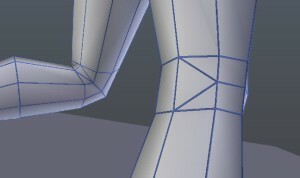 Typically, triangles are an unwanted topology type, especially when you are planning on having joint deformations. Triangles tend to not stretch or deform well, like a quadrangle would. 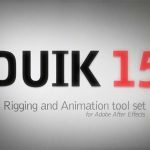 That doesn’t mean that you use triangles to strategically create an effect that you are looking for. Jonathan shows that by using two small triangles at the back of a knee, in the place of using edge loops, will allow the edges in the back of the knee to collapse. This takes the pressure off the rest of the mesh so that the thigh and calf will not take on an unwanted deformation when bending the joint.